After years of waging war on the World Rally circuit, be it through the woods of Finland or the atop the precipices of Corsica, Mitsubishi and Subaru found themselves competing for rally-bred sales on the showroom floor with their Lancer Evolution and Impreza WRX STI models respectively. But the upside-down economy has a funny way of turning the World Rally scene, well, upside-down. Now neither Mitsubishi nor Subaru compete on the famed stages of the WRC, but they are adding fuel to the fire at the dealership level. Hence the Lancer Ralliart, a pound-for-pound Subaru WRX fighter if ever there were one. Closer to the Lancer Evolution X (that’s Mitsubishi’s fire-breathing, eternally oversteering compact sedan) than it ever will be to the humdrum Lancer compact in its demeanor, the Ralliart was built to fill a void within Mitsubishi’s lineup that was previously left unoccupied. Funny, we swear Subaru said the same thing when they updated the WRX last year. So what does the Lancer Ralliart bring to the table? How does 237 horsepower, 253 lb-ft of torque, all-wheel drive and a twin-clutch SST automatic transmission sound? It definitely strikes a happy medium between the everyday Lancer and the superhero Evo X, but don’t look at it as an Evo on the cheap, because this car has a distinct character all to itself. Whether that character suits you or not depends on how you like your vehicle to perform. 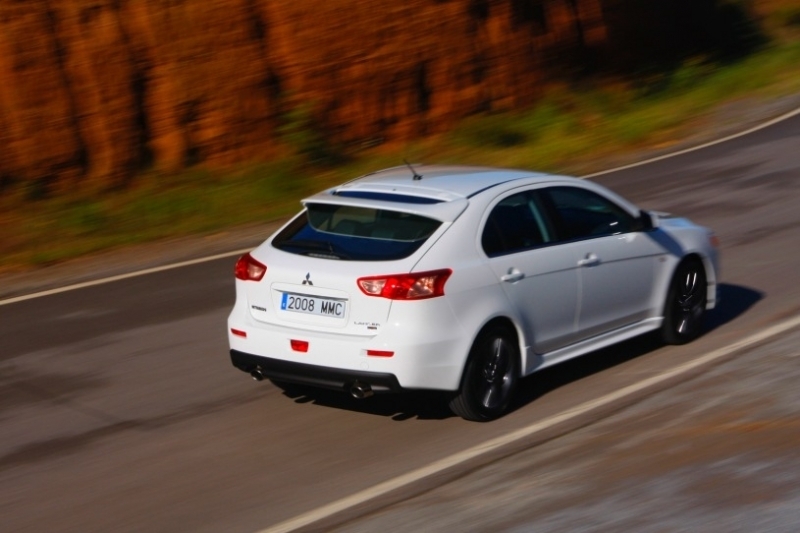 No other Japanese brand offers a twin-clutch transmission in this segment, and we applaud Mitsubishi for taking the lead and replacing the traditional automatic with a 21st century solution. 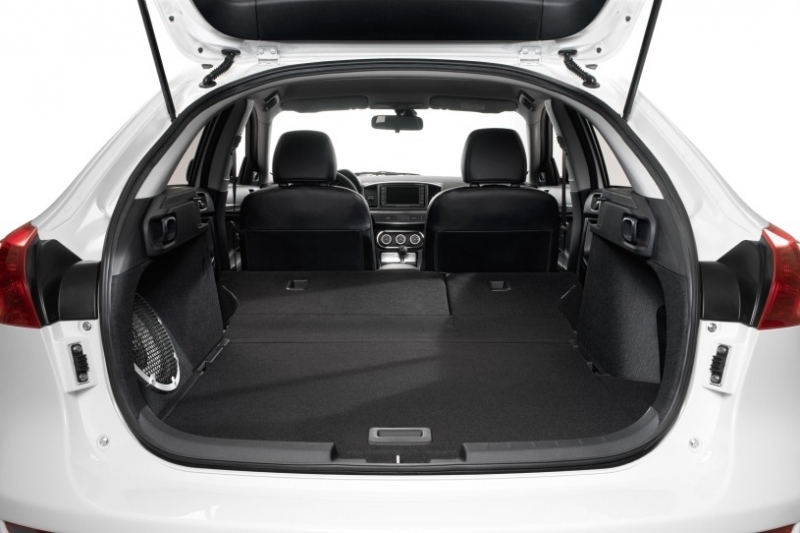 The Sportback’s hatch provides ample room for oversized cargo and if you need more space, the 60/40 folding seats are there to help. At $28,310 to start, the Ralliart Sportback comes in well above the competition, and the sedan is only a few hundred dollars less so there aren’t many savings to be had should you not need hatchback versatility. Fuel economy feels more Evo than Lancer, which isn’t a good thing, though the twin-clutch SST transmission does its best to shift into the highest available gear as quickly as possible. Coupled with the ultra-fast shifting twin-clutch SST transmission, the Ralliart’s 2.0-liter MIVEC turbo inline-four manages to feel more powerful than it actually is, much in the same light of its big brother, the Evo MR. There is a hard thump of torque around 3,500 rpm that really kicks you back into the seat, and as the revs climb you brace for more explosive acceleration, but unlike the Evo, it never arrives. Still, it’s very, very quick, with 0-60 mph coming up in under six seconds thanks to the short gearing, and you really feel like you can use the whole powerband in everyday conditions. Try doing that in an Evo and you’re likely to end up with a suspended license. The Ralliart’s helm appears to have been plucked straight from the WRC circuit, as it’s every bit as sharp as it is in the pricier Evolution. But unfortunately that’s where the similarities to the Evo end, because once you get the Ralliart into a corner it simply plows with stubborn determination. No matter what you do – power on hard, lift mid-corner, or any combination thereof – the Ralliart tracks true with little drama. Which is fantastic, except for the minor fact that when you put your foot in it mid-corner with an Evo, you get fantastic hero drifts. Don’t go in expecting such with the Ralliart and chances are you’ll be very pleased with its performance. The Ralliart is powered by a 2.0-liter turbocharged inline four-cylinder engine that produces a stout 237 horsepower and 253 lb-ft of torque. Power is driven to all four wheels via a six-speed twin-clutch automatic gearbox with a paddle-shift manual mode. The Recaro Sport Package is a bit misleading, in that it adds a whole lot more than just fantastically grippy Recaro sports seats that feel as if they were yanked straight from the pit lane. Also included are automatic HID headlamps and a six-CD/MP3, 710-watt Rockford Fosgate sound system that includes a 10-inch subwoofer and Sirius Satellite Radio. A navigation package is available for the Ralliart that includes a 40GB hard drive that moonlights as a music server, so you can simply copy your music over to the car and leave the iPod at home. Bring it along and you can plug it directly into the auxiliary audio jack. While it might have a small 2.0-liter engine, the Ralliart has a tendency to binge drink just like big brother. While not quite as bad as the Evo – in which you will seriously struggle to see the cheery side of 20 mpg – the Ralliart only returns 17 mpg city and 25 mpg highway. It is emissions rated at LEV-II if that helps you sleep better. 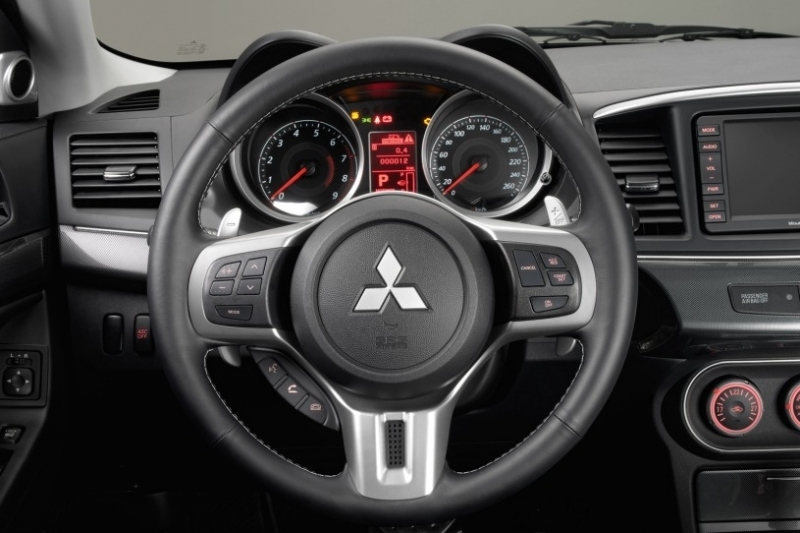 The Lancer’s interior took a step forward with its last redesign, and the Ralliart feels like a properly modern hatch, especially when equipped with the Navigation system. 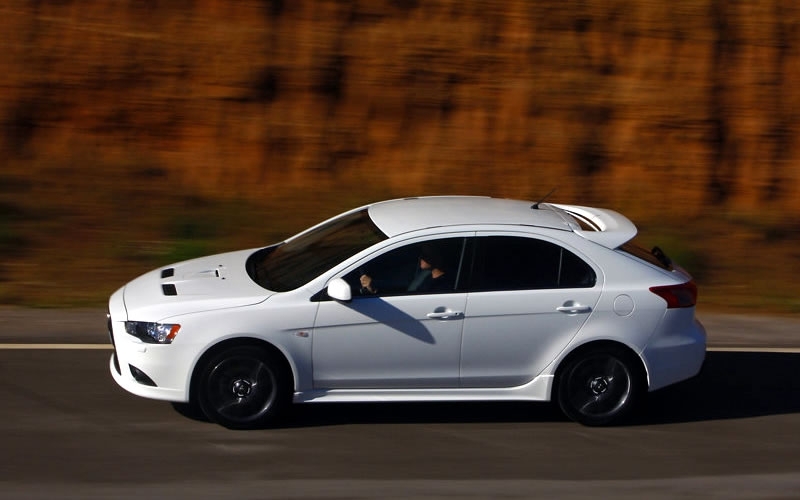 It certainly doesn’t feel like an economy car with a tricked out engine like the Evo IX did. Only black fabric is available. To help identify it as a performance-oriented model, Mitsubishi added some Evo-esque styling cues to the Ralliart, such as trapezoidal front grille, side skirts and a rear wing. The Sportback looks a bit odd with its angular hatch, but it certainly fits in with the rally-car-for-the-street crowd. 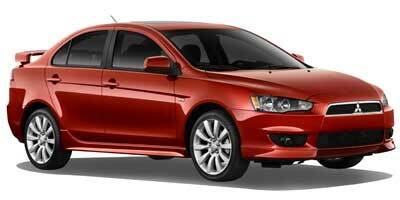 With an MSRP of $28,310, the Lancer Ralliart Sportback doesn’t come cheap. Keep in mind, however, that with that you get a trick dual-clutch transmission, something most manufacturers charge extra for. The most direct competition comes in the form of the $25,495 Subaru Impreza WRX Five-Door, but another obvious rival is Audi’s dual-clutch, all-wheel drive A3 Quattro 2.0T at $30,850. The Ralliart fills in a the gap in the Lancer lineup pretty well – especially given the bloated MSRP of the Evolution X – but if you are expecting it to run circles around the competition, think again. Sure it’s a little expensive, but when you consider it has all-wheel drive, a dual-clutch gearbox and will get you to 60 in under six seconds, you realize that it’s a good amount of car for the coin.